We Won! The 2017 Communicator Award. | ASTRALCOM - Content Strategy, Conversion Marketing and Customer Acquisition. We Won! The 2017 Communicator Award. | ASTRALCOM – Content Strategy, Conversion Marketing and Customer Acquisition. 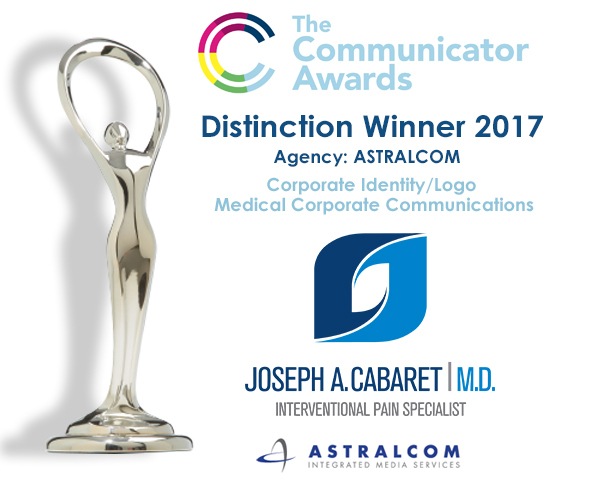 With over 6,000 entries received from across the US and around the world, ASTRALCOM is the proud recipient of the 2017 Communicator Award for their work in designing the Joseph A. Cabaret, MD Corporate Identity/Logo. The Awards are judged and overseen by a 600+ member organization of leading professionals from various disciplines of the visual arts dedicated to embracing progress and the evolving nature of traditional and interactive media. “We’re very excited to be winners of the 2017 Communicator Award,” said Bill Aitchison, Executive Creative Director at ASTRALCOM. “It’s a testament to the vision and dedication we bring to our clients and how we truly are a part of their success,” he explained. As the saying goes, “we’re in it to win it” and that means creating superlative outcomes that help our client grow – and even sometimes win awards. Read more in our press release at this link. Want a winning solution for your business? Contact us today.